Audio-Technica is featuring its new lineup of true wireless in-ear headphones this week at CES — the Sound Reality ATH-CKR7TW and Sonic Sport ATH-SPORT7TW, which both incorporate Audio-Technica’s new wireless technology that provides completely wireless earbuds while also promising to deliver the audio quality that le from the the company is known for. The ATle H-CKR7TW provide a sleek design and interchangeable 3D Loop Support for discreet yet secure in-ear fit, with button controls for music playback, volume adjustment, and answering phone calls. Specially tuned 11 mm drivers use a diamond-like carbon coated diaphragm that keeps the earphones lightweight while still providing fast response time and reduced distortion, along with machined brass stabilizers to reduce unwanted resonances and a stainless steel acoustic mesh resistor for improved high-frequency response. 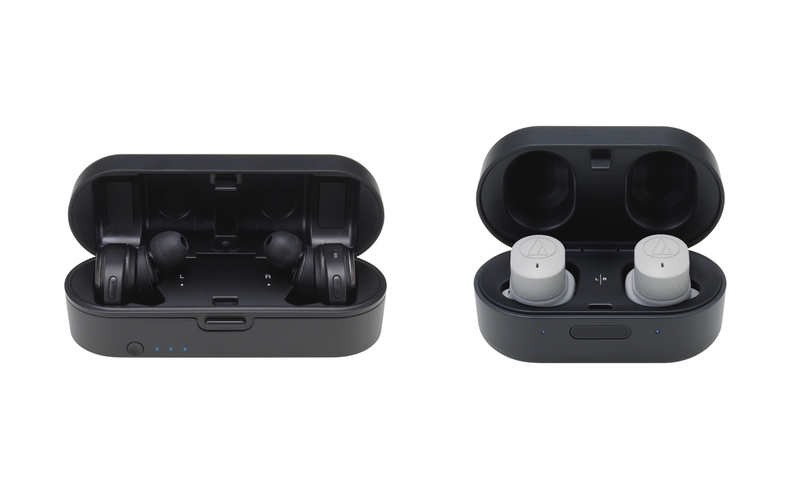 The headphones support Bluetooth 5.0 wireless technology and the aptX and AAC codecs, and can run for up to six hours on a single charge, with an additional nine hours available from the battery in the protective carrying and charging case. For more fitness-oriented listeners, Audio Technica’s ATH-SPORT7TW are designed with a stay-in-place fit, with compact earpieces and ergonomic Freebit ear fins so that they remain comfortable and stay in place during even high-intensity workouts. They’re also IPX5 sweat-resistant and can even be rinsed off under a tap. A switchable ambient hear-through function also allows users to hear environmental sounds for safer use outdoors. The internal battery provides up to 3.5 hours of music on a single charge, and the charging case adds an extra 14 hours, with a quick charge function that will get users up and going before a workout, providing 45 minutes of additional listening time from only 10 minutes in the case.